River Boy is a young adult novel by Tim Bowler, published by Oxford in 1997. It is the story of a teenage girl facing the prospect of bereavement. Bowler won the annual Carnegie Medal in Literature, recognising the year's best children's book by a British subject. 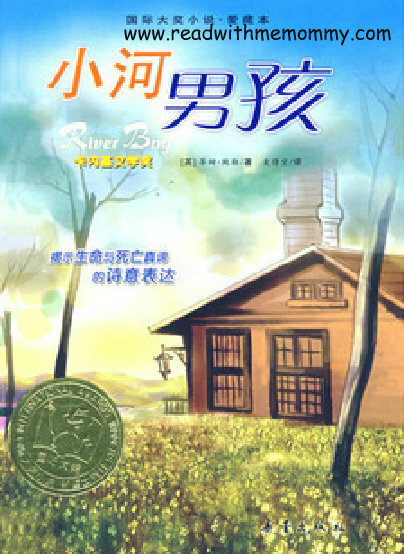 River Boy also won the 1999 Angus Book Award. This short novel is the chinese translation. Soft cover. Simplified chinese. 170 pages. Fifteen-year-old Jess, a dedicated swimmer, dotes on her grandfather, a fiercely independent and cantankerous artist. When he falls ill, he insists on returning to the isolated valley where he lived as a child to finish his last painting, a haunting landscape called 'River Boy'. Jess is desperately trying to cope with the knowledge that her grandfather is dying, and she does her best to help him finish the painting that is so important to him. While exploring the valley, Jess feels a strange presence and sees a mysterious boy in the river, now there, now gone. When she eventually meets the boy, he gives her some surprising advice that leads to the painting being finished against everyone's expectations. In return, he challenges her to join him in swimming down the river from the source to the sea, over forty miles. Jess refuses, saying she must stay with her grandfather, and watches him dive from the waterfall into the river. Soon after, hearing about her grandfather as a boy, she has a sudden revelation, and she swims after the boy to the mouth of the river, where he is waiting for her before finally disappearing. Jess then learns that her grandfather has died peacefully, leaving her his painting of the 'River Boy', which she now realizes is both a landscape and a portrait of the boy she met – a self-portrait.